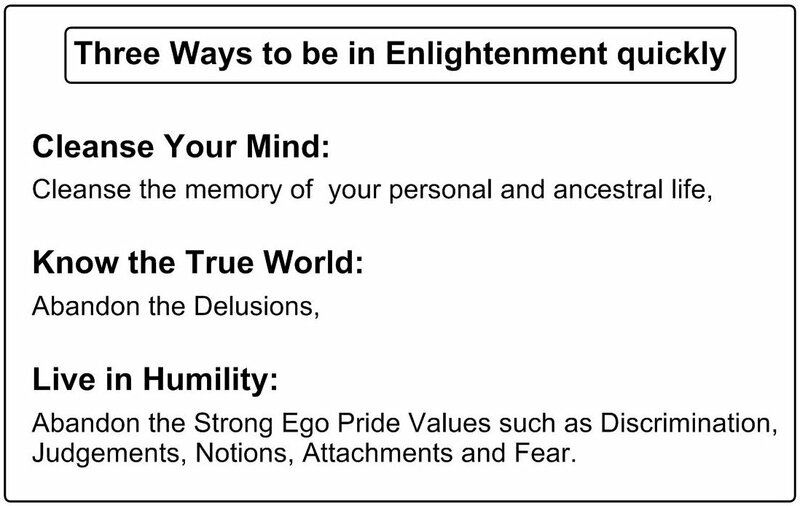 There are so many ideas about the definition of spiritual enlightenment. Some are truthful or some are totally false and delusional as what it is. However, there is no judgment from me as you are in the God’s world and free to make any suggestions albeit incorrect. I will say the enlightenment is identifying who I am by experience. Once you go through certain experiences you will come to realise all is God, nothing is not God and you cannot exist if you are not in the realm of God. We are in the life of God, we are in the dream of God. What is God? Herein God means not personal. But, according to many traditional beliefs, God is a sole existing individual entity like a person. However, for me God is a mind of the collective consciousness, the Universe itself includes seeing and unseen. Seeing is because we human beings can only see and feel 5 senses, which is heavily used and relying for survival. Thus created current belief system which is a personal God like feeling in general. In old times, we used to say there is nothing else exist except our 5 senses, which describes only material world. Unseen is because we human beings clearly now know that there are more than what we see through our 5 senses. We have already proven it through the many logical and physical processes. Such as in astrophysics, identifying dark energy and dark matters with the baryonic matters. but we have discovered them and use them as if nothings are special. A human being who is slightly more evolved than others will also discover that there are vast areas of the energy or conscious field which we are not aware of. Remember, human beings are only aware of 4% of total cosmic energy or cosmic consciousness. What is the rest (96%) of the cosmic consciousness? The understanding about what enlightenment is easier if you accept one truth. That is if you can accept one truth that is everything around you is God without exception. Or to make it easier everything around you is Universe that you are in the universe. God = Universe. All is God because you are in the realm of God, or in this universe. You are part of the universe or God. Therefore, you may not be the collective master consciousness of God, but you still are part of God. And you also have the ability to experience the being in master consciousness. The difference between an enlightened person and not enlightened person is only like a paper thickness. Why do I need the enlightenment? What is the benefit for me? The human life is continuing evolution to know more and more until you reached the ultimate end of the knowledge. The enlightenment is end of evolution for you. The end of evolution means you know why you are here and what you are. You get to know everything about life. It is nothing to do with what you decided to believe from what you heard or read books. The true knowledge is only coming from true experience which your deepest mind is accepted fully without doubt that you can depend your life on it. This knowledge will empower your future to live in this world with peace and health. They won’t be any crime, war, famine, sickness such as cancer nor any dictatorship. You won’t even need the laws to co-exist. All of your personal and ancestral karma will be neutralised. It means no more bad things will happen to you. There will only be love all and respects all. The human evolution is finally coming to an end. What you need is an experience to confirm that you are indeed the master consciousness (God). universe and experience the pure energy being, God. First time, you maybe be overwhelmed by the awe grandeur of the new world as you are only a tourist. However, you will soon love the new world and you will want more and more until you become the resident eventually. It means you are becoming one with the master consciousness while you are still living with an individual material body. You can explore heaven, whatever you like and as long as you like. You will soon discover there are many different realms of existence that is totally out of your material world of concept and knowledge. This is why you need to have experience the heaven before you die, otherwise how do you possibly to find heaven when you die. It is an absurdity. The material world is a primitive form of life and serves only one purpose that is producing new life and nurture. it is a higher realm of science. We called spiritual if anything is beyond our capability to explain and became the myth. The myth became the source of misguidance and becomes the pain and suffering in human life. because it is aware of itself and wants to live on thus carrying the evolution in time and space. A single atom is a spirit because it is aware of itself and wants to live on albeit the level of intelligence is only basic. Through the evolution an atom becomes more intelligent due to amalgamation into larger consciousness and still evolving in larger and larger collective consciousness. Given time it became a human beings too. The material world has only one purpose that is producing new life and nurturing to enter higher realms of existence. The other higher realms of life cannot produce a new life as they do not have gender or body to produce new life. All life comes from the material world as the lowest realm. Any higher realms are non-material, it is only the consciousness world that they draw life energy directly from the pure energy source to sustain their consciousness entity. They do not need to have the body, therefore do not require sleep and eat, and don’t have sickness thus no pain and suffering. It is indeed a heaven from material human perspective. State of current human beings on earth. The human beings almost reaching the end of evolution, albeit many people discredit human beings achievement. I can understand because what we do to others through the selfishness of greeds and wars. That is because the human beings lost its course of life in emotional energy. Everyone lives in emotional energy addiction without knowing. The emotional energy comes from internal conflict due to not knowing, which comes from the fear. we carry, which becomes the source of dirty emotions. This dirty or complex emotions are the reason to lose the course of life. Many human beings only concerning to serve the emotional energy addiction, nothing else in their entire life. They express this as having fun in life or boredom without a single attention to nurturing of their spirit to rise above. There are so many trapped spirits in this world, we called ghosts who could not rise to higher realm when they die due to attachment in this material world. It means they failed to nurture their spirit. Coinciding with industrial evolution, as the human population has increased, so too the number of the ghosts in this world due to the material attachments. It is a hell for them indeed. They simply decided to stay in this material world centred around materials. Human beings only have maximum few thousand earth years to live before all disappears from this planet, and some other species will take over our path as an intelligent and dominant species. In a colossal uncountable number of galaxies in the universe, there are so many intelligent beings in the material world. It is an absurdity that you think the entire universe is created only just for human beings on earth. It is illogical and a very narrow minded concept that we are alone. In the higher realms of the life, the life not only comes from the earth, but also comes from many uncountable numbers of other places in the universe. You will encounter many other spirits from many other worlds. It is up to you how deep you want to go. Any human beings can have a spiritual experience that you become one with the universe mind. There are many spiritual paths in this planet will guide you to have a spiritual experience. However, you must also aware and avoid the path which will only give you the emotional comfort that is actually becoming a hindrance. There won’t be any spiritual awakening. Our YMC path is a choice, which will give you direct and quick path without diversions. We do not call it enlightenment, we simply call it confirmation process by clean your mind and body to become free from emotional energy addiction and be one with God. You will be confirming that you are God. We YMC have 3 classes to becoming heaven goer. We have been teaching so many people since year 2006 guiding to see the heaven and heal all kinds of diseases. Level 1: Personal Mind cleansing. 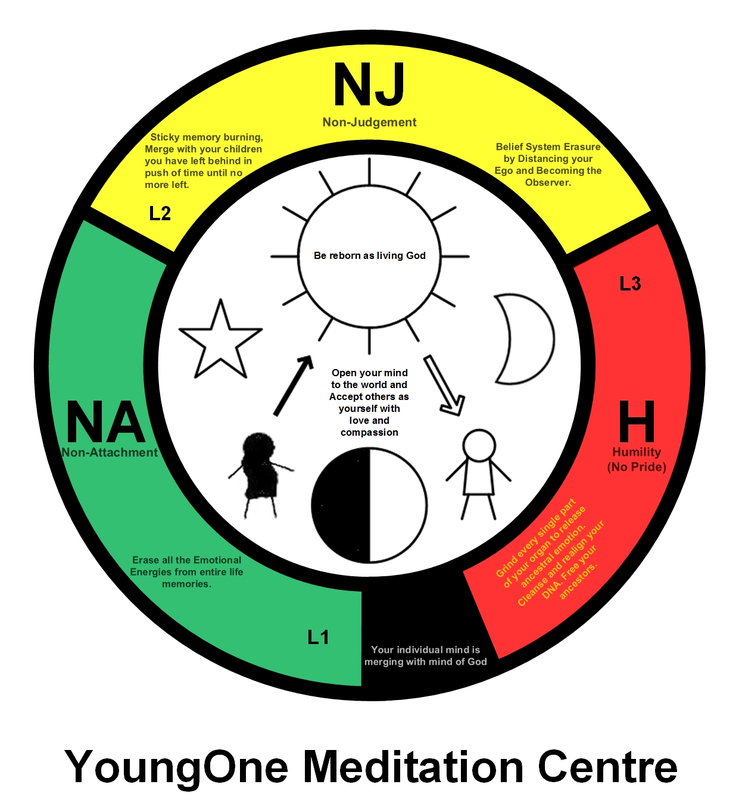 Level 2: Inner child process and belief system cleansing. Level 3: DNA (Body) Cleansing. Many will have a first experience crossing into a higher realm at this level. Universe Class: Guiding how to explore the heaven. Above course is designed to free you from emotional energy addiction, then guide you to have experience of the higher realm within 6-12 months. The duration of the study is entirely up to you. You must fulfil the certain requirements. Everyone can attend our course, especially for people who are born into this world with exceptional sensitivity. Strong spiritually means higher sensitivity. Sensitive people cannot live this material world in peace due to higher levels of emotional energy from others. These people will suffer throughout their life because nobody will recognise and support their strong spirituality. Trying to live with others will cause pains and suffering with many diseases. Our confirmation Process will identify who you are and empowers you to help others too, and you will finally discover your purpose in life. Wake up Mankind! Be Evolved! How long are you going to live in darkness with greed, conflict and suffering? We can help you to solve on these issues very easily. Are you born with extreme sensitivity, but nobody offered you to develop fully? We are bringing highly evolved human beings into this world like you, but nobody is recognising your ability and offering you to develop fully. Has your life been in suffering always as the result? We can help you to COMPLETE your journey. To achieve stable and solid Out of body State daily. Our Meditation will transform and take you to the end of human evolution. You will be freed from the journey that has started from aeons ago. It only takes about 6 months to 1 year of weekly guided studying from home to change you for permanent peace and health! 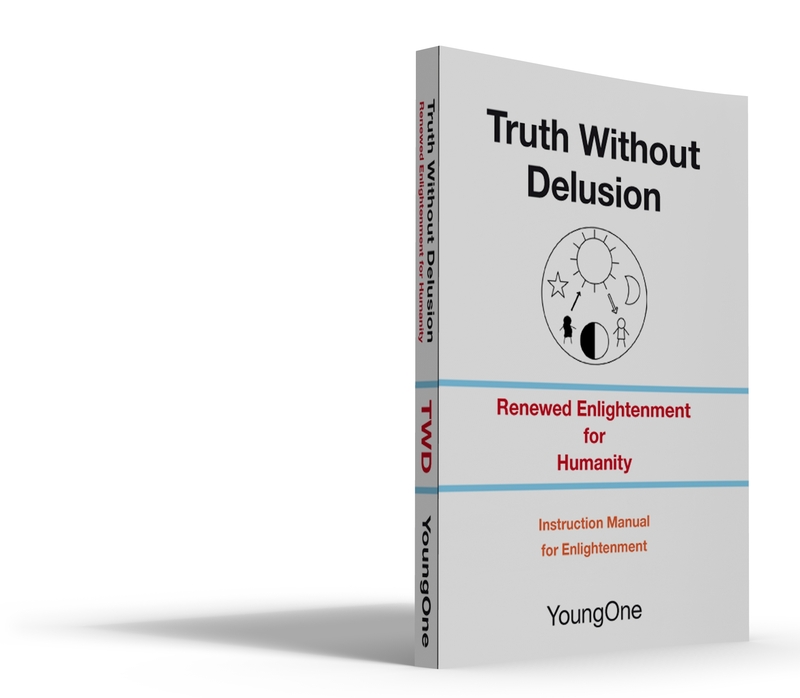 The Book "Truth Without Delusion"
Written by Master YoungOne is out now! "Centre of Mind Cleansing Study"
Most people come to realise, I or my identity is only within my physical body, which is in confinement with only limited knowledge and ability filled up by family upbringing, tradition and educations. It brings the feeling of insecurities, unhappiness and lostness. Discovering your true identity will give you infinite peace and happiness beyond this realm of existence. There is a sad child crying, angry, depressed and scared that you have left behind time, causing endless emotional energy to influence rest of your life. People say knowledge is power but just knowledge itself is only a source of conflict. The true knowledge is a natural transformation of yourself in living according to the knowledge. Enlightenment is thought to be only for the chosen people who inherited pure ancestral mind and devoting their entire life for the way of truth, but let me tell you, taking on our path, it is for everyone as long as you are a human being. You too can be an enlightened person easily in very short time. We will teach you how to cleanse your mind to reduce your ego emotions and guide you to the path of enlightenment for permanent peace and health. It only takes about 6 months to 1 year of weekly guided studying from home to reach beginning stage of true enlightenment. Would you not try if this can change your life permanently to live in peace with glowing health? 1. Many people think God is a human being like or having human characteristic (Anthropomorphism). - God is not anything like a human form. God has no gender and formless yet everything. God is a consciousness of the physical Universe. 2. Many people still promoting and teaching the judgement concept of Right and Wrong, Good and Evil which are based on the survival of the fittest, which is the vertical power system that originates from animal instinct. - Transform your vertical system of pride that rule or submit into a horizontal system of respect, empathy, cooperation, diversity, interdependence, responding instead of reacting, love and compassion. 3. They do not know how to change or transform the people. - Just threatening, showing the direction or result of good example is not the answer. You must have a logical, scientific, gradual and broadly appealing system of teaching method to transform the people. In our Hornsby Centre: Every Saturday 2 PM. Internet Seminar on Skype: Every Saturday 4 PM. Please book for the seminar in advance. Address: PO Box 583 Glen Innes, NSW, 2370, Australia.